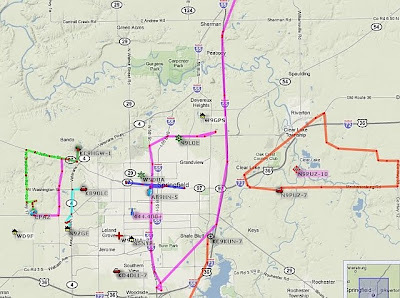 The other day I was looking at NVIS antennas and wondered what sort of coverage I might get from my location. Basically I wanted to see a circle drawn around my town with a radius of around 300 miles. The solution was at the Free Map Tools website. Specifically the Radius Around A Map Point page. In addition to solving my immediate problem there are all sorts of other potentially useful things there. Give it a look. This Saturday, October 2nd, is the 2010 Simulated Emergency Test or SET. If you are an ARES member I hope that you're planning to participate in some form or another. This helps to keep us ready for the day when a large scale disaster strikes and we have no instant messaging, no tweets, no Facebook, no cell phones. Here in Springfield, Illinois where I live we have a new opportunity for the first time in many years. 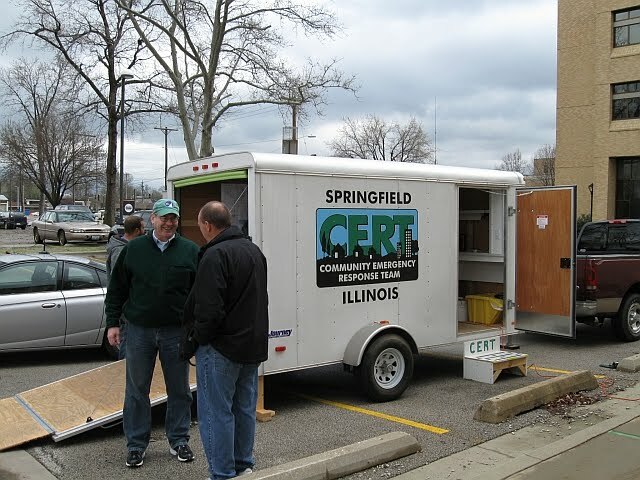 This will be the first activation of the new RACES station at the Illinois Emergency Management Agency. The station isn't fully operational yet as equipment has just started arriving but we do have some HF capability along with local VHF/UHF comms. We're bringing in all three operating teams to do some training and a little building and configuration along the way. Traffic handling is a dying art that we really should save. It's hard to think of sending a message through the National Traffic System when we have cell phones, email, and even shudder, the plain old telephone system. But when the chips are down, and one day they will inevitably be down, at least some commercial infrastructure will fail. Amateur Radio and the NTS will still work--if we remember how to use it. 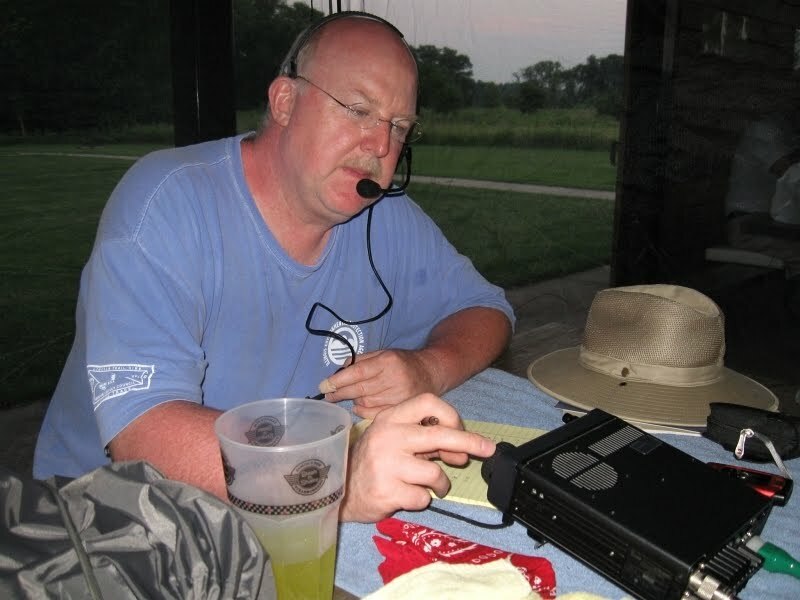 The Illinois Sideband Net meets every day at 6:00pm local time. The frequency is 3.905 MHz SSB. There isn't typically much if any traffic to pass. The beauty of checking in every day or at least once a week is that you know your antennas are still up, the radio and power supply works, and you remember how to use it all. If you are a Ham living in Illinois please stop by some evening for a visit. 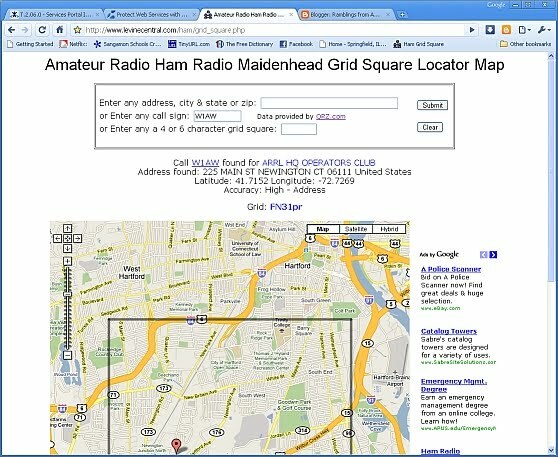 You can read up on working within a traffic net on the ARRL web site. Two major events today. First, it was my wife Teri K9TLM and my 28th wedding anniversary. Life just keeps getting better. Second, this is the weekend of the Peoria Superfest which we have attended for many of those 28 years. 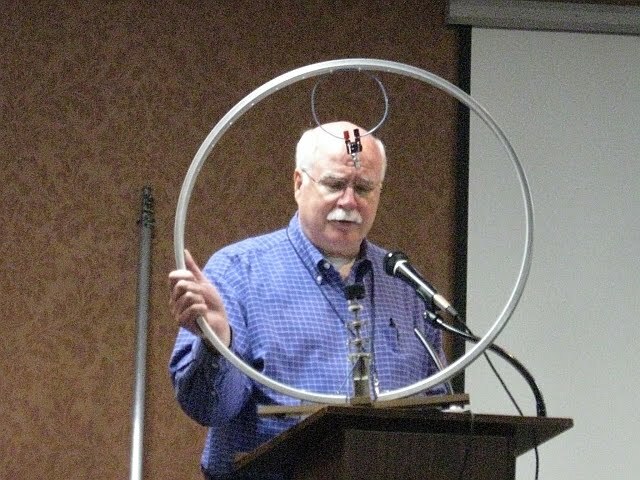 This is a long running central Illinois hamfest. This year the weather was against them. A fairly severe rain storm just before lunch time kind of killed off the flea market business. An awful lot of people packed up and headed home early. Too bad, the weather was beautiful later in the afternoon. It was good to see old friends and put faces with newer ones. Most notable was a face to face meeting with James K8JHR from Wyoming, MI. We've talked on the radio several times and had many email discussions but meeting up at big events like Dayton has eluded us. On the way home Teri and had dinner with friends Bob K9KGO and Dorothy KB9WAN at a neat little place in Mason City, IL named Jack and Jo's. Excellent food. I highly recommend the Cajun Pasta but I can't recall ever having a bad meal there. Hope you had a good Saturday as well. September 9th was a sad day. My long time friend Jim Dunn K9CNP passed away. Writing about Jim deserves more of a book than a blog post but I want to hit a few of the highlights. I first met Jim in 1977. 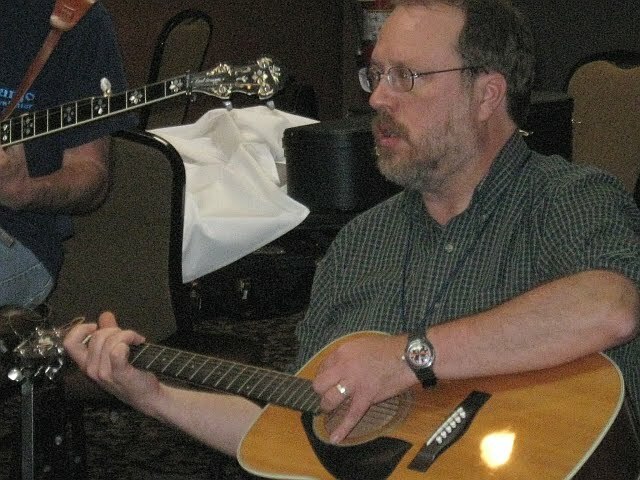 He was an instructor in my Novice licensing class taught by the Sangamon Valley Radio Club. He became one of my Elmers and we've remained close friends ever since. Jim was a Broadcast Engineer. He maintained many of the area AM & FM radio stations. A few years after we first met he took a position as Chief Engineer for the radio station at the University where I worked. There were many memorable lunch time discussions and a work related projects that I enjoyed very much. You never worked with Jim on anything without coming away having learned something. 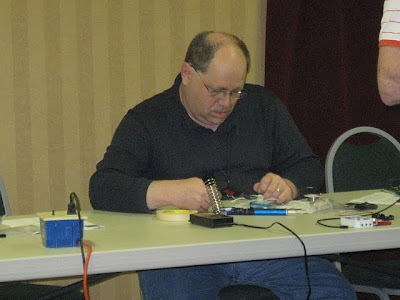 Jim was very active in Amateur Radio to the end. He was a Volunteer Examiner for years, The ARES Illinois Section Traffic Manager, and the ARES Emergency Coordinator for Sangamon County. Jim also co-founded our local Sangamon/Menard County ARES group. In his spare time Jim liked to travel, operate outdoors, and camp. He also built beautiful Native American style flutes. 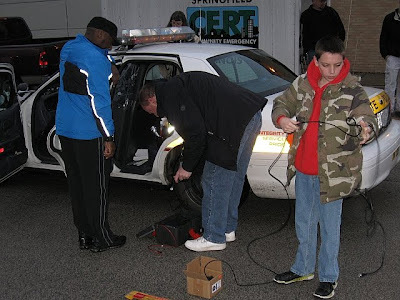 Jim K9CNP doing what he loved. I can't yet imagine how much we will all miss Jim. He will never be forgotten. 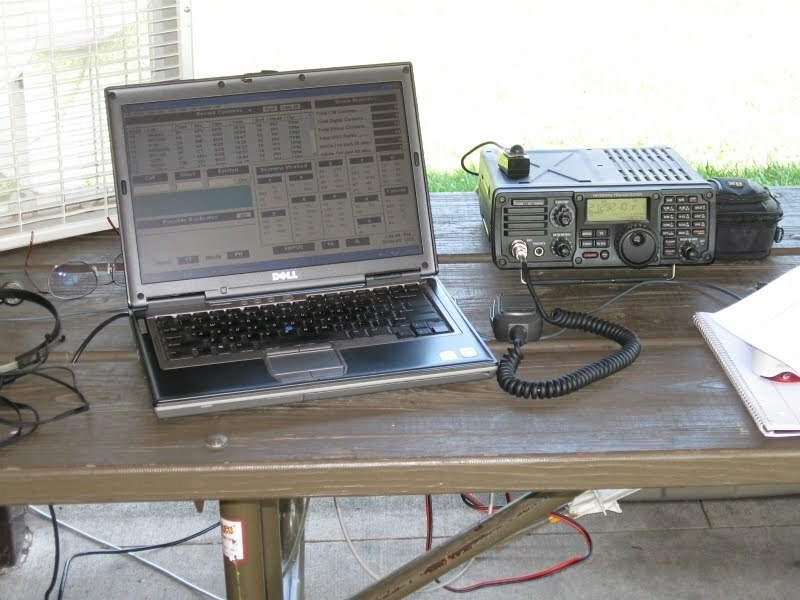 Today was the NAQP - SSB Contest. Originally I wasn't sure if I could participate at all but it turns out I worked the contest for a couple of hours. The bands weren't great. I only operated on 40 and 20 Meters because my antenna decided it wasn't going to load on 15 Meters and by evening 75 Meters was horribly noisy here. I made 39 contacts with only 9 multipliers total. This afternoon I had a chance to play with filters, read about various settings in PowerSDR, etc. I was tuning around 20 Meters looking for some adjacent signals to play with filters. 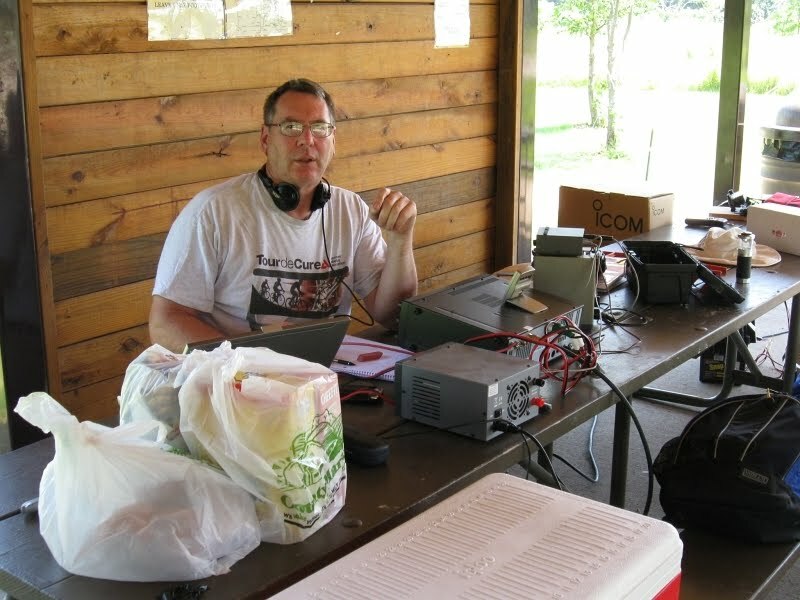 I came across CO0LC running a string of callers from his Cuban station. I figured "what the heck" and tossed out my call. After my first call he said "the Papa Uniform Zulu station please?" I gave my call again, we exchanged reports, etc. 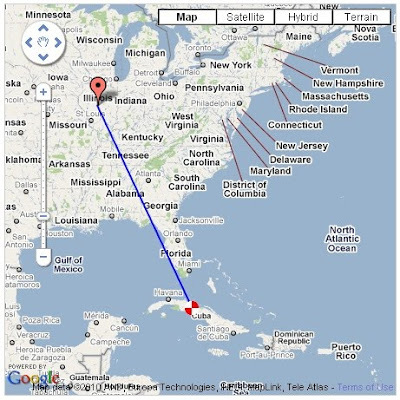 Okay, so Cuba to Central Illinois isn't exactly a rare contact. But it is 1,328 miles with 5 Watts and my inverted V... on SSB no less! I'm a happy camper. The Flex 1500 continues to be a lot of fun. Today I confirmed that my regular ham shack computer, a 2GHz Pentium 4 with 1.25 GB of RAM isn't enough to make things run smoothly. As an experiment I switched to a Dell laptop with a dual core Centrino processor at 1.8 GHz. All the drop outs and occasional screen freezing is gone now. This testing was all done with PowerSDR 2.0.5. Now that those problems are cleared up I'll try PowerSDR 2.0.6 and the new firmware if the thunder ever goes away so I can bring the ham shack back on line. Well, a new radio has arrived here at ARS N9PUZ. 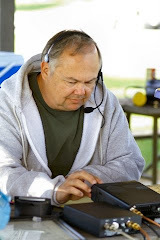 I've been keeping an eye on the Software Defined Radio technology for a while and this year I decided to take the plunge and pre-ordered a Flex 1500 at the Dayton Hamvention. The BBT ("Big Brown Truck") brought the small package yesterday. The Flex 1500 is a QRP (5 Watt) version of some of Flex Radio's bigger offerings. There isn't too much in the way of hardware as the bulk of the heavy lifting is done by a high powered digital signal processor ("DSP") and a largely open source piece of software called PowerSDR. The photo above shows the Flex 1500 perched atop my Mirage MP1 SWR/Watt Meter. I don't think I'll be needing the 2kW range for this one! The radio itself may be small but that doesn't mean you won't end up with a rats nest of cables. Here you can see the USB cable, headphones, microphone, and key plugged in and ready for action. Above is a shot of PowerSDR along with my CW keyboard program. Other than powering it on and off, everything about the radio is controlled through the software. Modulation, demodulation, filtering, band changes are all done in software. That's it for now. I haven't had a lot of time to learn and play yet but I'm pretty sure it's gonna be a lot of fun! Hot. Humid. Lots of fun! Last winter Dennis WD9EEK approached me about doing a smaller ARRL Field Day operation than usual and heading to Jim Edgar Panther Creek Wildlife Area in central Illinois. We decided to move forward with that plan and invited a few friends to join us. The weather forecast included thunderstorms, temperatures in the mid 90's, and high humidity with a heat index over 100 degrees. A couple of people thought wiser of it and didn't come out but the four of us that did had a good time in spite of the weather. Here are a couple of photos I thought I'd share. Our emphasis was on fun and although we each operated as individual entries I think there were around 500 Q's between us. WD9EEK above was the instigator and handled reservations at the sight. Just before dusk on Saturday he was still making 20 Meter phone contacts. 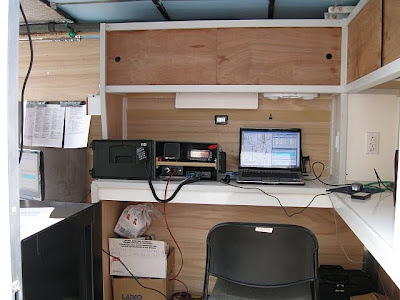 Bob KC9HGW operated mostly 20 and 40 Meter cw with his Icom Pro 3. No picture of yours truly. I'm the man behind the camera. 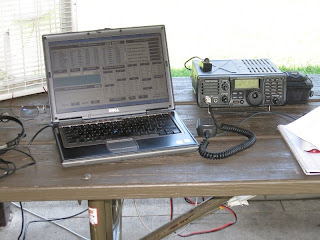 This photo shows my IC-7200 and laptop running N3FJP's Field Day Logger. That's it for now. I've got everything unpacked and enjoyed a nice shower. I think a nap is in order! Well, it's Field Day time once again. I could look at a calendar to tell that but there's an easier way here in central Illinois. We had a gorgeous spring season with cool evenings and mild, sunny days. The past few weeks though it gets hotter every day and we have thunderstorms and heat indices in the 100+ F range. With weather like that it just has to be time for Field Day. This year I'll be operating from Jim Edgar State Wildlife Area near Ashland, IL. Dennis WD9EEK and Bob KC9HGW will be there as well. Hope to work you this year! I've added some information on breathing some new life into older Kantronics KPC-3 TNCs. These are often available at bargain prices and you can make them very useful as digipeaters for APRS, etc. For quite some time now I've been meaning to move my web site and redo some things. That has finally happened to some extent. The site continues to be found at www.n9puz.com. Hosting is provided by HAMS4U and I highly recommend them. 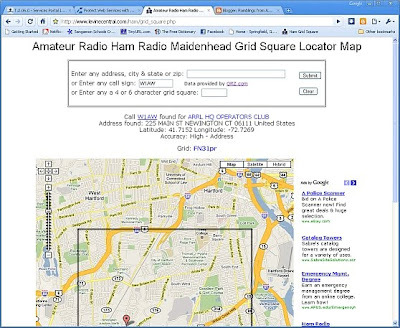 They do a great job and obviously cater to Amateur Radio. A few of the articles on the old site are missing. They will be back but contained outdated information, broken links, etc. that will get fixed in due time. 2010 has certainly turned out to be a busy time. So much that I've done a really bad job of keeping up with the N9PUZ blog here. Hopefully this post will bring you up to date and I'll have to post more on projects as I go. First off there was exciting EmComm news here in Illinois. 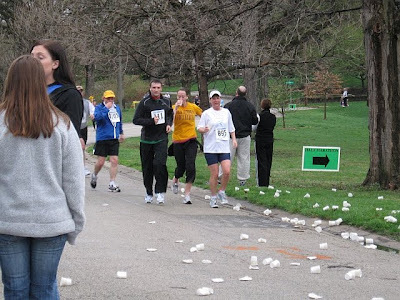 The Governor and the Illinois Emergency Management Agency announced that RACES once again has a role here. Shortly after that announcement Brad Pioveson W9FX who is the State RACES Officer and Jim Pitchford N9LQF who is one of the two Assistant RACES Officers asked if I would help with station planning for the primary Amateur Radio station that will serve the State Emergency Operation Center. Next up I was appointed to the ARES position of Illinois Assistant Section Emergency Coordinator for Digital Operations. 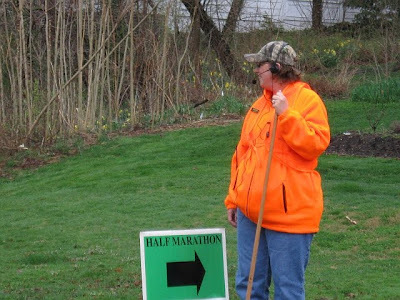 This covers some of the same issues we're looking at on the RACES team but also encompasses what I hope will be some opportunities to help ARES groups in other counties use various digital communications technologies more effectively. At this point in the process I am in learning mode. I'm trying to find out what people are currently doing, what they would like to do, etc. There are some fun things on the horizon as well. 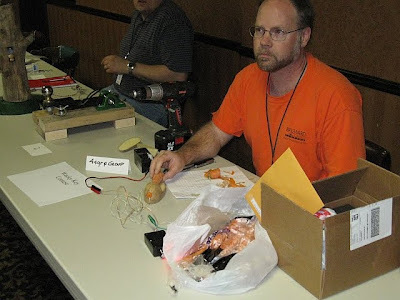 In a couple of weeks my wife Teri K9TLM and I are heading to Branson, MO for the 2010 Ozarkcon QRP Conference. 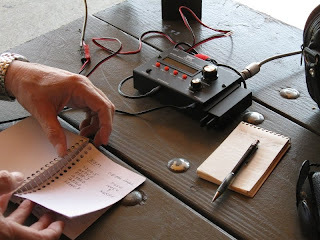 We'll also be making our annual pilgrimage to Hamvention and FDIM in Dayton in May. There are a couple of interesting projects in the works too. I'll save those for another post. 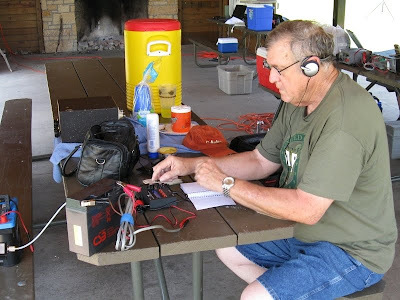 Today was the Wisconsin QSO Party. I didn't have a lot of time to play so I decided to stick to 40 Meters and operated QRP CW. Those multipliers really add up -- my 10 contacts netted me 320 points!